My apologizies to email subscribers of the Boonie Blog. You are getting links to old posts and I have no idea how to fix it. It seems Feedburner gets un poco loco when you transfer a feed from one site to another and regurgitates the past. I have found several complaints in their help forum, but no one from the company — owned by Google — has answered. So, I may just Twitter them to death until I get some resolution. In the meantime, I did learn that I did not have to create a new feed and ask email subscribers to switch over. I simply could have transferred the feed y ya. So, if you haven’t re-signedup yet, ixnay on the sign-up-ay. And hey, if you want to unsubscribe, now is the time. 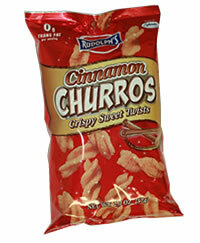 To make up for the cyber flakiness, I am going to tell you this week about those free chile and lime chicharinas and churros I gladly accepted for free as Mommy Blog Payola…I usually turn down free gifts, but seriously, would you turn down free churros? We receive your feed at Qoobole! Latino social network where we promote it through Twitter. We noticed you were or are having problems with your blog – so I want to let you know that Qoobole! has blog tools at your service for free. Join us at Qoobole! and we can promote your blog for free through our Twitter following and users. We hope we have interested you into joining Qoobole! Latino social network.